In Korea, the national budget is fixed by the National Assembly every fall. From fall 2018, the Korea Association of Social Workers has been making proposals on the social welfare budget. One of them is the budget for local children’s centres. 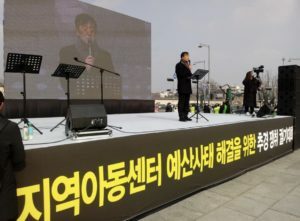 In December, groups of local children’s centres began holding tents in front of the government’s Seoul office in protest of the National Assembly’s unreasonable budgeting, and street demonstrations were held in front of the government’s Sejong Center. On Jan 15, 2019, social workers working in childcare area were united and rose up in the open area of Gwanghwamun where you can see the official residence of the Korean President (the Blue House). That’s how the social workers in Korea rose up to solve the budget crisis of the local children’s centres. The number of participants was estimated to be 6 thousand. First, the National Assembly and the government should set aside the extra budget to ensure proper operation costs for local children’s centres! Second, apply the single wage system of social welfare facilities to the employees of the local children’s centres and pay separately for labour costs! Third, ensure proper program cost to ensure a minimum quality of child welfare services! The Korea Association of Social Workers (KASW) had been working together with ‘the National Association for the realization of the single wage system of child welfare facility employees’. In the recent budget crisis, KASW is closely cooperating with the political parties and the government offices. The president of KASW, Seung-hwan Oh, mentioned the value of labour guaranteed by the Constitution, the value of identity security at the level of government employees by ‘the Act on the improvement of treatment and status of social worker, etc’ and the value of the ’Convention on the Rights of the Child’ by UN. We will work closely together, including coordinating to resolve future budgetary issues. The keynote is the realization of a national single wage system. ‘The National Association for the realization of the single wage system of child welfare facility employees’ aims to improve the vicious circle in which poor treatment of social workers in the child care area leads to a higher turnover rate and difficulty in finding jobs, which in turn leads to a decline in expertise and negatively affects the facility use of children. ※ Leaded by 4 organizations, such as <National Council of local Children’s Center>, <Korea Council of Group home for Children & Youth>, <Korea Child Welfare Center Association>, <Korea Association of Social Workers>, etc. ▲ Ultimately improving children’s welfare services by introducing more standardized(characterized) services.